The number of different materials used to make thread winders is astounding; bone, glass, tortoiseshell, horn, baleen, straw, ivory, zebra wood, walrus ivory, and porcelain to name just a very few. Of all the different materials used those winders made from straw are the least seldom seen. Straw thread winders have an interesting history and are highly sought after. Occasionally straw thread winders come up for sale. It has been common for them to be described as being from the Napoleonic War era and made by prisoners. Napoleonic straw work has almost become a catch-all phrase for describing all kinds of straw work, no matter when or where it was actually produced. The description of various straw work pieces should not be blanketed under one phrase. Citing the Napoleonic War era, covering approximately three decades, as responsible for the production of so many varied straw work styles is just not reasonable. When it comes to accuracy, the straw covered thread winder shown below was indeed made by a prisoner. But not by a prisoner of the Napoleonic War era (1785-1815) so says Diane Pelham Burn in her book, “Thread Winders A Collector’s Guide”. It would be another 55 years before this straw item would be made by a prisoner somewhere else in the world. Did you notice the above winder is made from dyed straw? In the Napoleonic era the only dyes available were from natural sources found in plants (indigo, woad, madder, brazil-wood, turmeric and others), animals (shellfish purple,cochineal), and minerals. While these dyes could produce a large range of colors, there were still some colors that couldn’t be produced by natural means. The straw on the winder shown above is not dyed from natural dyes. In 1856 a young chemistry student, on break from the Royal College of Chemistry in London, stumbled upon the first synthetic dye quite by accident. Eighteen year old William Henry Perkin’s accidental discovery produced a new color, he called mauve or mauveine. He patented this first aniline dye formula in August 1856, and set about manufacturing it on an industrial scale. An example of his newly discovered color, shown below, is courtesy of the National Museum of American History, and is described as: “Perkin Mauve” dyed silk, 1860. Within a short amount of time, factories producing aniline dyes were built across Europe. Perkin’s colorful discovery eventually found its way to commercial use all across Europe changing the world forever right up until today. 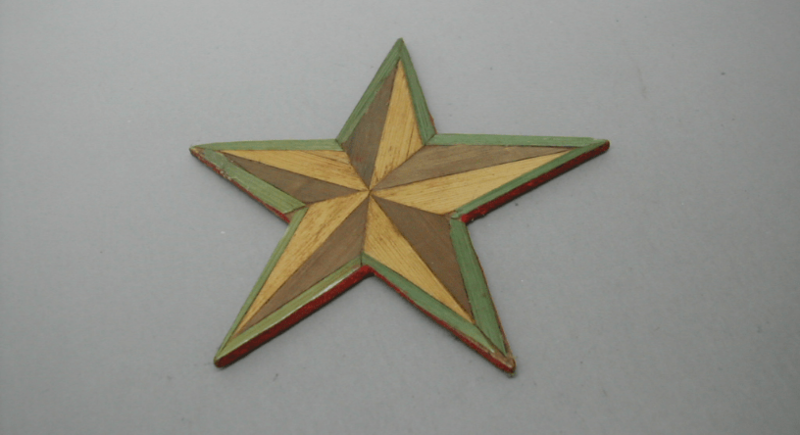 The point is; from the late1850s through the1860s and beyond vibrant bright and new colors were available. The evidence these aniline dyes were used to dye straw comes from the objects themselves. The prisoners who made the straw covered thread winders were working in Germany between 1870 and 1900 advises Pelham Burn. Thus far we have been unable to establish the prisons’ locations in Germany. 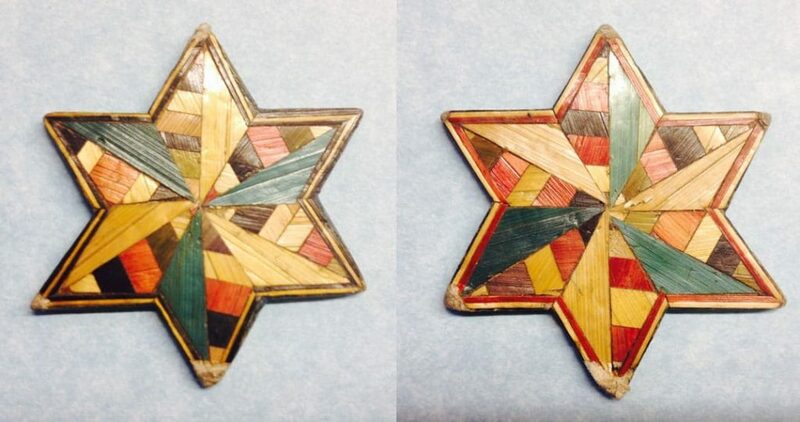 The colors on the surviving straw thread winders originally were vibrant 100 plus years ago. Perkin’s invention and the introduction of a range of aniline dyes, which give strong bright colors enable the dating of some straw items. Perkin’s dyes, and those made by other companies, were vibrant compared to the paler shades obtainable from plant dye. Dyes with strong bright colors such as mauves, greens, reds, magentas, blues, violets and yellows are almost certainly commercially produced after this time, not before. Therefore the straw thread winders we have located thus far, and present here, cannot be from the Napoleonic War era. The straw covered winders were produced for 30 years. Why are there so few found today? Constructed of straw on cardboard made of blotter paper these utilitarian pieces have somehow survived intact. 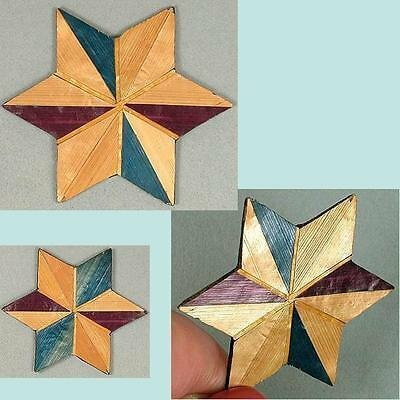 According to author Pelham Burn, “thread winders on card stock were often thrown away when they became shabby.” As a result they are quite scarce today. The winder shown, both sides, below is from The Straw Shop Collection and measures 2 inches tall and 2 inches across point to point. On the same page of Taunton’s book is another brightly colored straw thread winder. 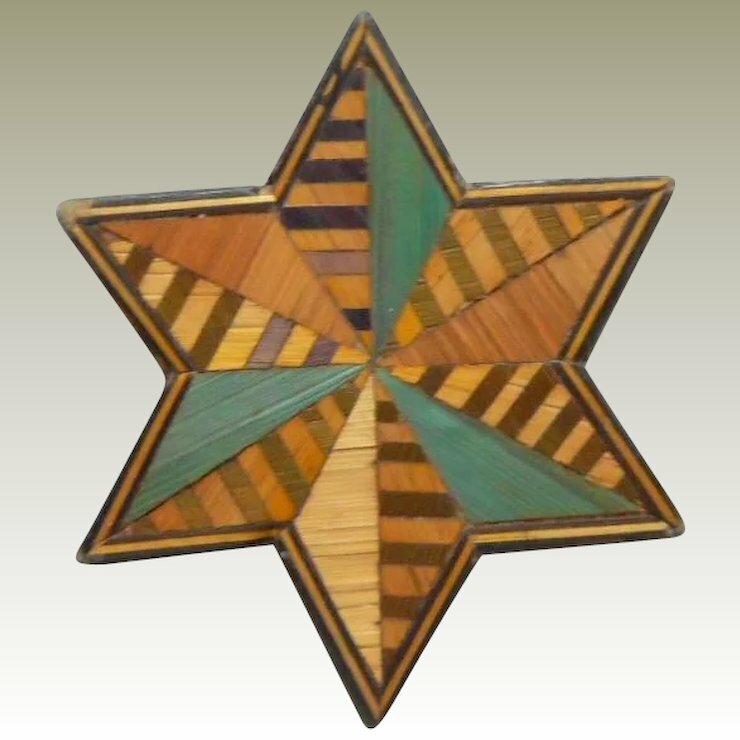 Note this star shaped winder has eight points. We were fortunate to locate yet another colorful winder. The winder shown below measures 1″ 7/8th inch from point to point. The patterns in the straw work are unusual. The colors are vibrant even today. 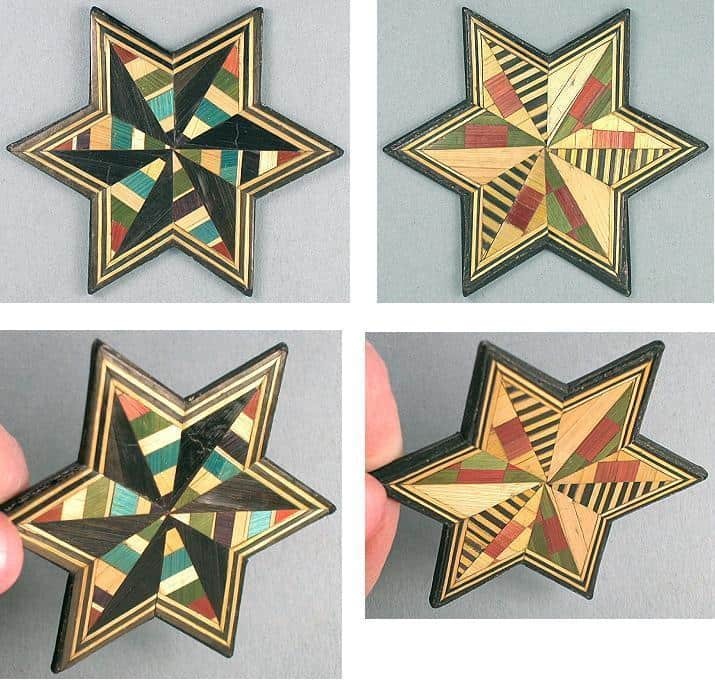 The straw stars made by prisoners vary. 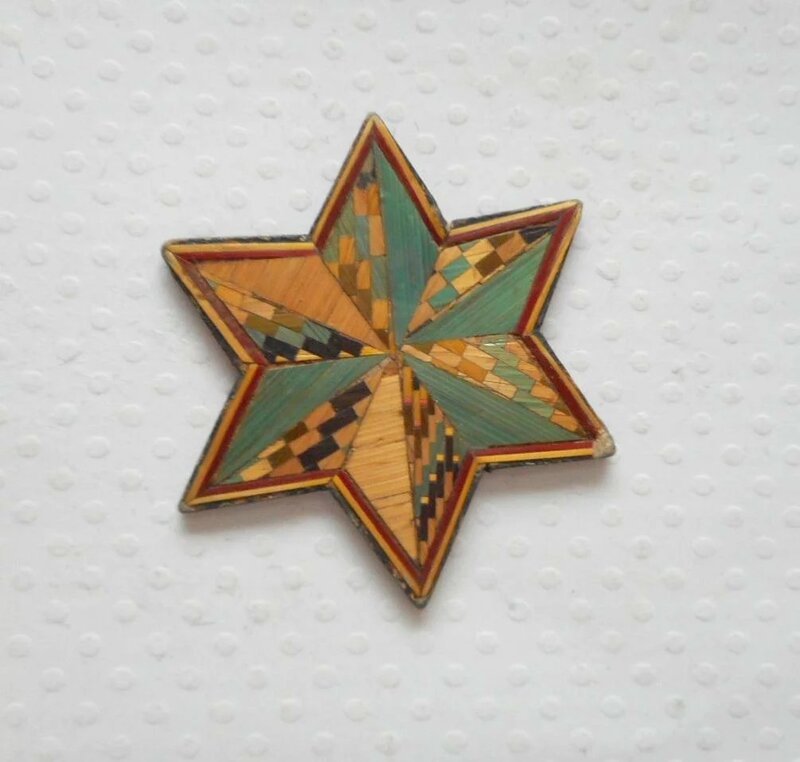 The Straw Shop also notes the various star shapes of the straw covered winders shown here. 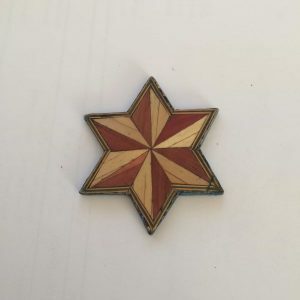 Some are six pointed stars, others are five pointed stars. 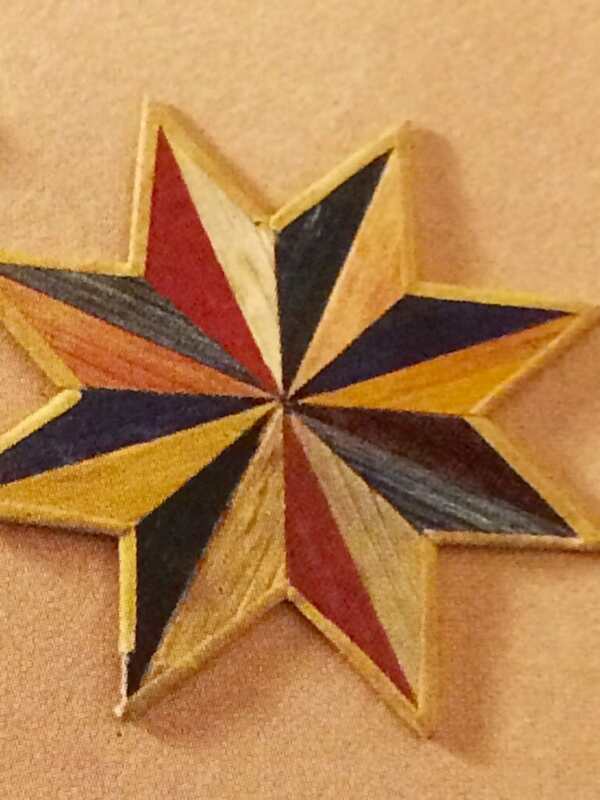 Similar in shape and size, each straw winder was individually created and decorated; thus their appearances are unique through the dyed straw color selections, placement, and number of points in the star shape. 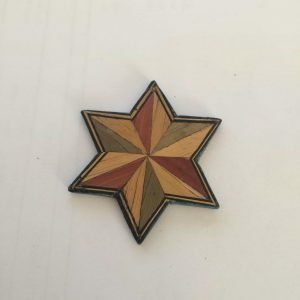 Since they are similar in shape and pattern to those attributed by Pelham Burn to German prisoners, and given the lack of additional evidence, we are currently assuming these are also made by German prisoners. The front and reverse images of the below straw thread winder unfortunately were not attributed to a source, other than collected and posted on Pinterest. In the photograph below, the winder is described as being “German from 1890” by Collector Carole Morris. Notice the blue, purple, green and yellow straw. The photo found below on Pinterest describes the straw winders only as German. Please look carefully at the colors in these two samples. So very many of the shades shown below simply were not available until after the 1860s. In addition to the straw covered thread winders above, The Straw Shop wanted to discuss yet another type of a straw covered winder. According to Pelham Burn, “winders were also produced of woven natural dried grass. Many small baskets to hold thimbles were made of this material; thread winders however are unusual. ” She also says that, “Sewing accessories of grass are exclusive to the United States and are Indian craft-work from the first part of the twentieth century.” The “grass” covered winder shown is edged with passe-partout tape which was widely used in home crafts during the 19th and 20th centuries. In summary, according to researchers, the straw covered winders, as opposed to the “grass” covered winders, appear to have been made by prisoners in Germany, in the late nineteenth century, after the advent of synthetic dyes and long after the Napoleonic War era. The eight examples shown above, a large collection of its type, exemplify the rarity of this once indispensable sewing tool. The Straw Shop welcomes additional information and images of straw thread winders. We know there are collectors out there and would enjoy hearing from you! 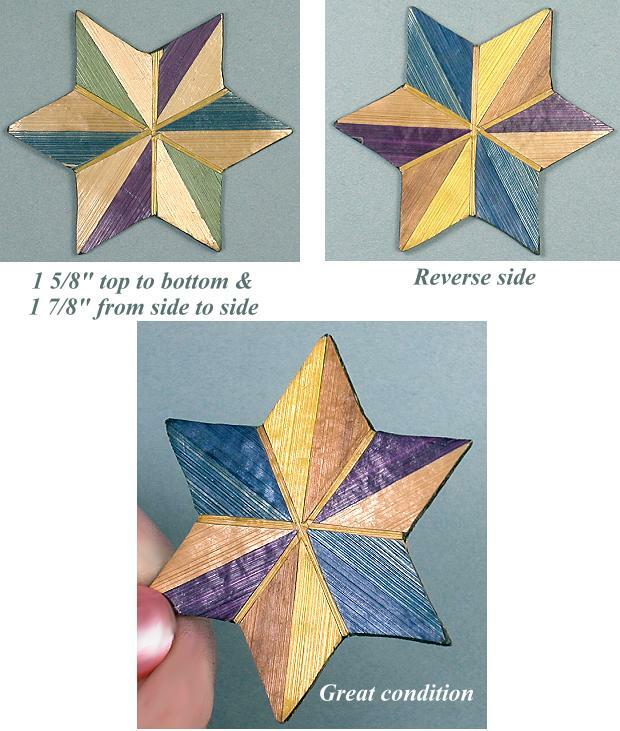 The Straw Shop is exceedingly grateful to Diane Pelham Burn for documenting her passion and knowledge of sewing tools in her 2010 self published book, “Thread Winders: A Collector’s Guide”. Her researched documentation was invaluable. Additional information was gleaned from, “Mauve” written by Simon Garfield, Christie’s Catalog ,” The Ruth Mann Collection of Sewing Tools and Accessories, part 1″ dated 2005. Two other books, “Antique Needlework Tools and Embroideries” by Nerylla Taunton and “La Marqueterie de Paille”, by Lison de Caunes and Catherine Baumgartner were of assistance. An article, entitled: “Terminology: What are the aniline dyes? (or the history of mauve and mauveine)” written by the Dreamstress published September 13, 2013 was also valuable in our research. 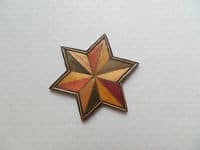 Additional acknowledgements extend to the kind permission of Carole Morris, Julie Holyoke and The Straw Shop for the use of images from their private collections. Copyright Jan Huss, The Straw Shop, 2016.